The market has been on a crazy roller coaster over past month and a half. In that time, we have seen the value of our portfolio drop by almost 10%! Fortunately, my wife and I are long term dividend investors and are not panicking. We will sit back and continue to collect our dividends this month and the remainder of the year – despite what the market is doing. Better yet, we plan to ramp up our new investments to take advantage of this downturn in the market. We saw an increase of over 120% last month compared to August 2014! That is fantastic growth and shows the delayed results we are seeing with increasing our new investments over the past 6 months. The market is now in correction mode, so this is a dividend investors dream. We increased our monthly investments compared to last month as a result. Just wish we had more available funds to put into the market, but that time will come. We decided to increase our automatic investment for WalMart last month from $150 to $500. With the market in deep correction mode, we wanted to take advantage of a great dividend company selling at a discount. Comparing the past six months, our 12 month forward income has grown by 30.4% or by $376.32! We saw an uptick of $24.88 from last month, which is about what we would expect each month based on the new money we are investing. The dividend income earned in August ($90.83) was up over 100% from the same time last year. This is all a direct result of pumping more and more money into the stock market. 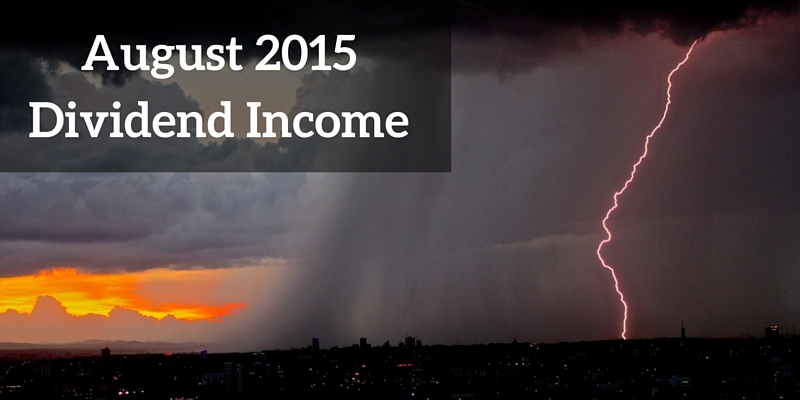 To date, we have earned a total of $817.15 in dividend income for 2015. At this rate, we would earn around $1,375 in annual dividend income this year. Since our goal is to earn $1,500 this year, we have a lot of work to do over the next 4 months. How was your dividend income in August? What stocks are you buying in this market? Full Disclosure – At the time of this writing, we owned shares in the following stocks noted in this post – CAT, CLX, LOW, MSFT, O, OHI, PG, UL, VZ, and WMT. The material above is not a recommendation to buy. Please do your own research on a company before deciding to invest.